While editing Ron Toonen’s column on Linckia spp I found myself inspired to try one of these beautiful sea stars again. For too many years I watched them disintegrate in local pet stores, and the one I tried in my own reef tank barely lasted a week, before meeting the same fate. 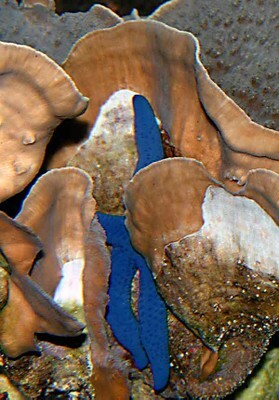 I purchased a blue sea star from one our sponsors, which was overnighted to me from California. I immediately tested the specific gravity of the water in the bag that the sea star was shipped in. It was 1.017 and my system water was and is 1.025. Following Rob Toonen’s advice I began to very slowly exchange the water in the shipping bag over the course of the next 24-hours. I added an air-stone to the bag that the blue Linckia came in. After the 24-hours I place the animal on a large Echinopora, where it remained for almost a week. During that time, however, it did not show any signs of disintegrating. A few days ago, finally, it began to move about the coralsin my reef tank, hopefully finding things to eat. A few days ago a local reef keeping friend got a mail-order shipment from another California vendor, who was offering red Linckias (_Linckia multifora_? ), three for the price of two. My friend gave me the third one. I checked the specific gravity in the bag that the red linckia came in, and it was very close to my system’s – 1.023. Like the blue Linckia, I slowly exchanged water, but this time for only 6-hours. What I found particularly interesting is that this sea star only stayed where I put it for one day, after which it began moving about and hopefully feeding. 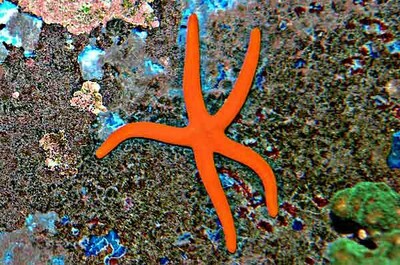 If these two sea stars acclimate successfully to my 10-foot reef tank I have Rob Toonen to thank. I understand that my limited, anecdotal experience with acclimating Linckia sea stars is hardly constitutes scientific proof, but it is comforting to know that my experience is consistent with the advice given in Rob Toonen’s column. Bottom line, if you go sea star shopping, go with ahydrometer, and ideally with a print out of Rob’s column. This issue of Advanced Aquarist brings us two new columnists and a new feature author – Alf Nilsen. Not wanting to sound like a groupie at a rock concert, let me simply say that when it comes to aquarium husbandry there is no one more versatile or accomplished than our new columnist Greg Schiemer. Greg begins his series of columns on how to successfully maintain one of the more difficult wrasses to keep in captivity — The Psychedelic Wrasse (_Anampses chrysocephalus_). 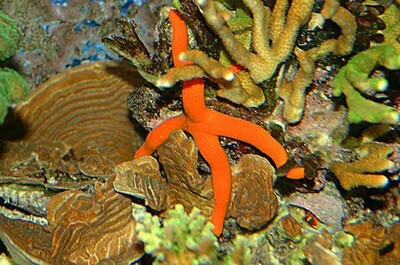 These sea stars pictured on this page are recent additions to the author’s reef tank. “He entered the private sector in 1969 and developed the basic technology for breeding Florida pompano in 1970. He accomplished the first commercial culture of marine tropical fish (clownfish and neon gobies) in a garage in 1972, and over the years has reared over 30 species of marine tropical fish, including spawning, rearing, and even hybridizing French and grey Atlantic angelfish. His latest rearing project was the propagation of the Red Sea orchid dottyback in a small fish room at home. Moe is the author of a definitive book on tropical Atlantic lobsters, Lobsters : Florida Bahamas the Caribbean, as well as his popular and best selling marine aquarium books, The Marine Aquarium Handbook : Beginner to Breeder and The Marine Aquarium Reference: Systems and Invertebrates, and [_Breeding The Orchid Dottyback_]. He founded Aqualife Research Corporation in 1972 and Green Turtle Publications in 1982. He and his wife Barbara now write and publish books onmarine life and aquarium topics, and work with experimental keeping and rearing of aquatic organisms.” To say that Martin Moe is one of the best friends our hobby knows is itself an understatement.